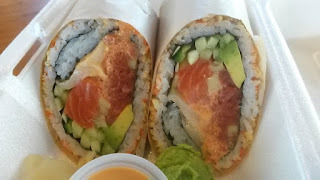 Last month, I returned to Wasabi Sushi for a new menu item, one that is not normally found at many sushi spots. While I already knew that Wasabi Sushi had excellent sushi and incredible presentation on their dishes, they became one of the first (if not the first) in Portland to serve sushi "burritos." 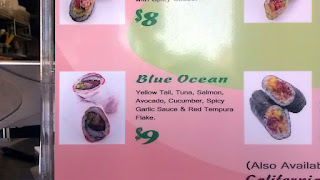 Think large sushi roll, cut in half, with at least 2-3 times the filling of usual sushi. 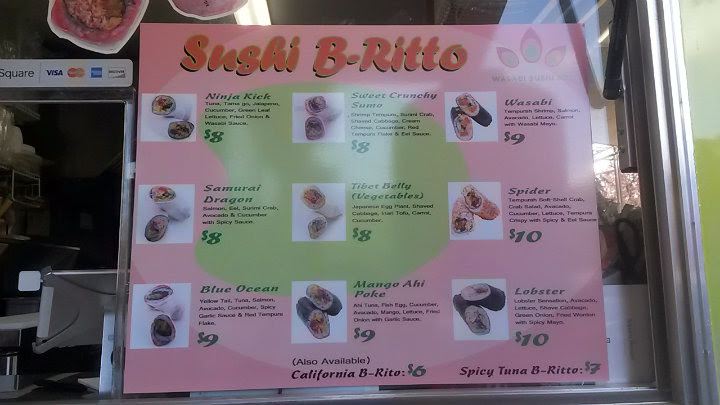 The menu board has at least 11 different sushi burrito options. 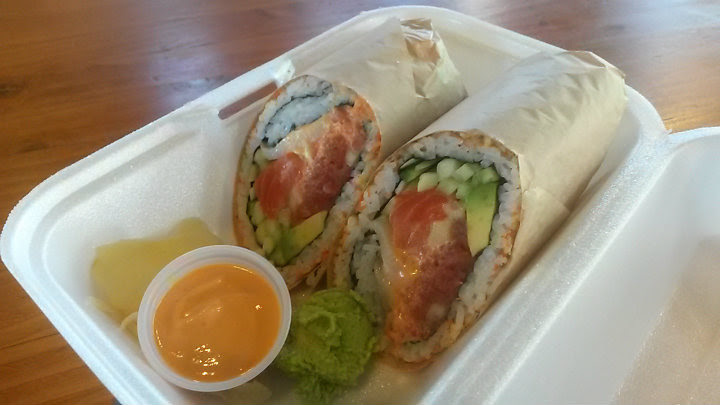 You can also make your own sushi burrito with whatever fillings the cart has on hand. 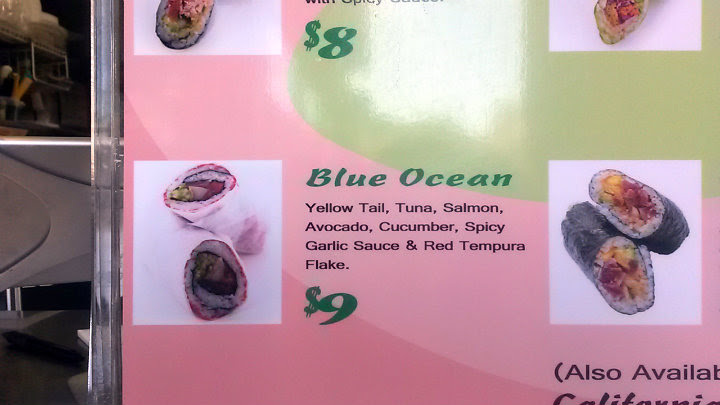 I went with the "Blue Ocean" sushi burrito ($9): Yellowtail, Tuna, Salmon, Avocado, Cucumber, Spicy Garlic Sauce, and Red Tempura Flakes. 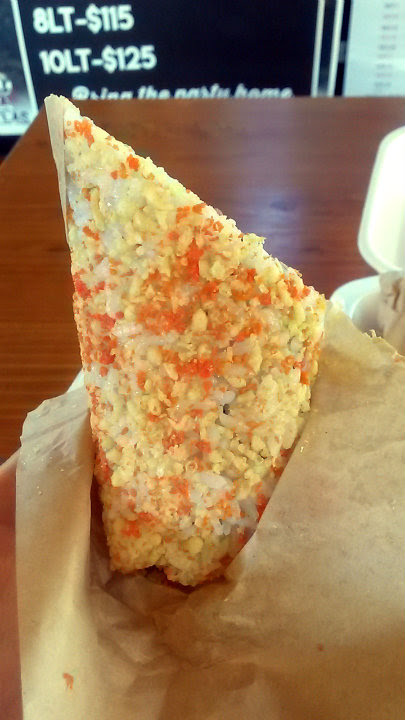 It's an inside-out sushi burrito, with the tempura flakes and white rice on the outside. The burrito is wrapped in paper and cut in half, then served with more spicy garlic sauce, wasabi, and pickled ginger. If you haven't had a sushi burrito, you're totally missing out. 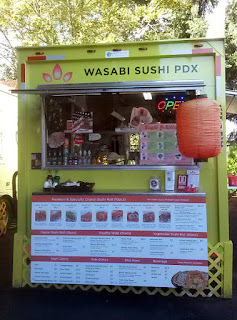 Lots of fish and crunchy veggies here, but the spicy garlic sauce is what really brought everything together. 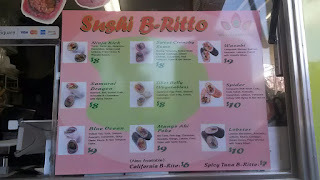 After scanning all the options, you really cannot go wrong with any of the sushi burrito options here. The "Samurai Dragon" ($8) has eel, the "Wasabi" ($9) has shrimp tempura, the "Spider" ($10) has soft shell crab, and the "Lobster" ($10) option should be rather self-explanatory.